Summer is well and truly behind us and Autumn has hit the UK. I love being able to look at my wardrobe and picking out summer items to match and pair with cosy big knits, scarf's and boots. Along with colour blocking, one trend I will be wearing in the colder months is the maxi skirt. I love wearing the flowing long skirts with summer tops, wedges or flip flops and feeling very girly and really don't want to leave them hanging in my wardrobe over the colder months. Granted, I don't think I can pull them off in the snow - Maxi skirt and wellies??? Um... Nope it wont work (no doubt I will try it out though). The images above are some that I had stored away on my computer and I love how they are all styled (to help me with some inspiration) and the last image is a great example of a maxi skirt for the colder months. Are there any trends that you'll be carrying into Autumn from the Summer? Source: Pinterest.com (if anyone knows where the images are from, please let me know so I can credit). FABULOUS collection of images! Summer is just getting going here in Brisbane, and I've stocked up on maxis too. I love that they're romantic and comfortable, can be layered for cool mornings, are totally work appropriate, and they're the perfect canvas for showcasing spectacular accessories. Another summer trend to push into fall - how about neon accents with warm neutrals? i have the first maxi purple skirt and this summer i wore it like jeans. I love them even though i'm not very tall! Great inspiration pics! I'm definitely going to be wearing my maxi skirts this fall with knits. seriously cannot get enough of the maxi skirt/dress. perfect transition to fall! What amazing photos to compliment your post. 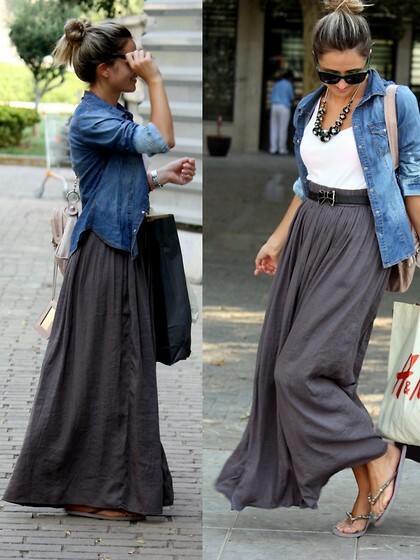 I LOVEEEE maxi skirts and you have shared some beautiful ones. I am so so with you in loving them though and wanting to mix them in to my wardrobe (for any season if I can!) :) Enjoy the cooler months looking fab in such a great trend. yeah the maxi skirt is so super hot, especially in bright colours! I love this trend to. I actually only hopped on it hahaha. Agreed, I love this trend!